What Servicemember Protections Are Available to Families? HOME > Blog > General > What Servicemember Protections Are Available to Families? Even those familiar with the Servicemembers Civil Relief Act (SCRA) may wonder what servicemember protections are available to families. After all, it’s not just servicemembers who are protected by the SCRA — it’s their family members, too. However, these protections are not automatic. Almost always, family members must go to court to get a court order to invoke protection. Otherwise, the only servicemember protections available to families are for the servicemember alone. When determining the status of military personnel’s family members, the court takes into account their level of dependence on the servicemember. 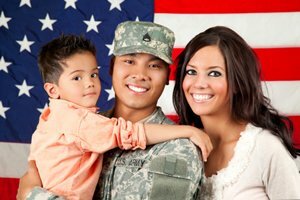 Spouses and children are usually eligible for dependent status, as well as others the servicemember may support. This level of support has to exceed 50 percent and be continuous for 180 days prior to application for protection. The kinds of servicemember protections available to families may include protection from eviction or vehicle repossession. But the SCRA also spells out servicemember protections available to family members who co-sign loans. However, this only kicks in with a court order. To achieve this protection, the family member must first prove the servicemember’s military status. The court will also want to know the nature of the debt. In other words, for the servicemember or their family to qualify for SCRA protections, they must have entered into the debt before being called to active duty. These considerations can amount to an exhausting array of hurdles family members must clear in order to gain SCRA protections. And there is no guarantee they will prevail. Further, the courts do not allow reimbursement for attorneys’ fees in these cases. Thus, family members must make a cost-benefit analysis before embarking on the process. Servicemember protections available to families aren’t impossible to get, but they aren’t easy either. Just go to court and ask. For help getting a military status verification or military affidavit, depend on the Servicemembers Civil Relief Act Centralized Verification Service.